Can we get a 5-6v version for servo motors? Could this be used to power an ESP8266? I bought a cheap 3.3V step up elsewhere but it didn't work. I think it was due to too much line noise. Be sure to check the data sheet. Don't plan for 200mA from a single AA cell. The max current depends on the input voltage. I just had an idea. If you cut through the center track on the bottom. And soldering one or more silicon diodes in series between Vin and the via behind the regulator (or the middle pin if you can handle soldering tiny things) should get it to shut off in UVLO situations. It should shut off when CE goes below 0.3 V. So if Vin is a silicon diode drop (estimating 0.6 V) higher, it would shut off when NiMH cells are near-empty around 0.9 V. Similarly 2 NiMH AA would require 2 silicon diodes in series. 0.3 V + 2x0.6 V = 2x0.75 V It's a bit close to degradation voltage. But maybe you are able to select diodes when buying a big bunch, with higher than average voltage drops. Caveat: I don't have these (yet) so I can't test. Just a suggestion. P.S. If some one can test this for me. As I don't think I can generate controlable low Vin with the limited equipment that I have. Diode drop to CE pin doesn't work. The current is in the order of uA, so the voltage drop is much lower than 0,7. Even tried it with a yellow led to make it shut of around 2v. No workie. Neither did a simple voltage divider on Vin (1M+220k). The shutdown threshold was not sharp enough. Going to try to switch it with a true voltage detector. Too bad this doesn't have an adjustable low voltage cutoff. It looks like it's capable of way overdischarging a single NiMH cell and would be a lot safer with a cutoff set to around 1.05 volts. There ain't much energy left in a NiMH if you discharge it below that level, but it does a lot of damage in terms of shortening the life. Does anyone know of a low profile diode that will also suffice for the NCP1402? I have made a test board that works using only 0603 parts for the caps and inductor, but can't find a smaller diode. It would be really cool if you guys stocked these with the NCP1402SN30T1G and NCP1402SN27T1G for 3.0v and 2.7v output. What is the Quiescent Current? Should be less than a 100 microAmps. Lots and lots of capacitors. I am using one of these but I'm getting an Output Voltage of 4.8V. Using 1xNiMH AA battery, 1.3V for power. 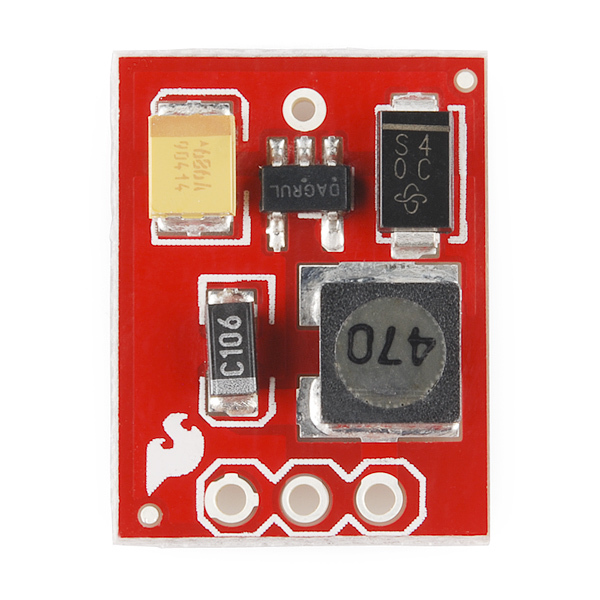 The description for this product indicates that the input voltage is 1 to 3 Volts, however the data sheet for the NCP1402 indicates that it will accept up to 6Volts. Is there some reason that this unit is more limited than the base part? A step-up breakout must obey the property Vin < Vout, so Vin must be less than 3.3V. 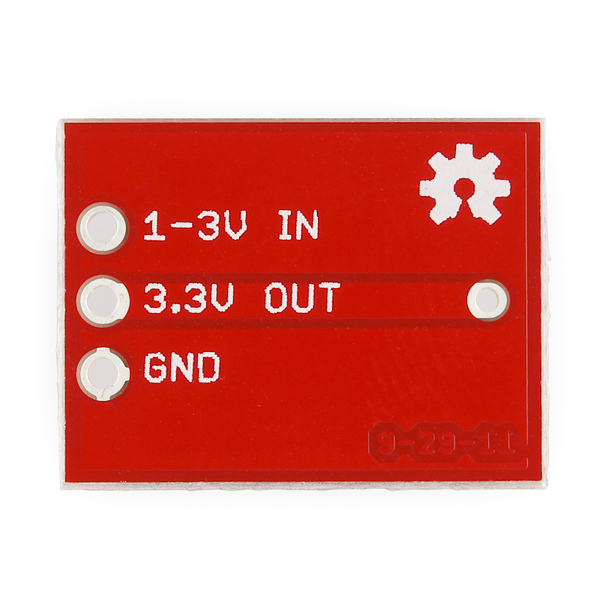 The 5V version of this board can accept a larger input voltage only because the output voltage is higher. What would happen if you did plug in a higher voltage? I bought a bunch of these and plugged some into a power supply and got the input voltage up to almost 9V before the board fried. The output voltage went up, of course. On the other hand, a couple boards seem to have gone wonky when they got voltages around 4V. I'm not totally sure that it was the 4V that screwed these boards up or if something else happened.... any ideas? If you read the datasheet, you'll find a list of suggested components and part numbers. You should be able to source these from Digi-Key, Mouser, Newark, etc. I'm trying to do the same thing and am having a hard time finding the inductor listed in the datasheet. Anyone have a link to where this part is available? I haven't been able to find an exact equivalent part at any of the major suppliers either. Tested with several loads and variable power supply -- worked per specs. Good product. This is the most useful kit for anyone who intends to design low power battery operated projects. An advantageous amalgamation of size, function and performance. 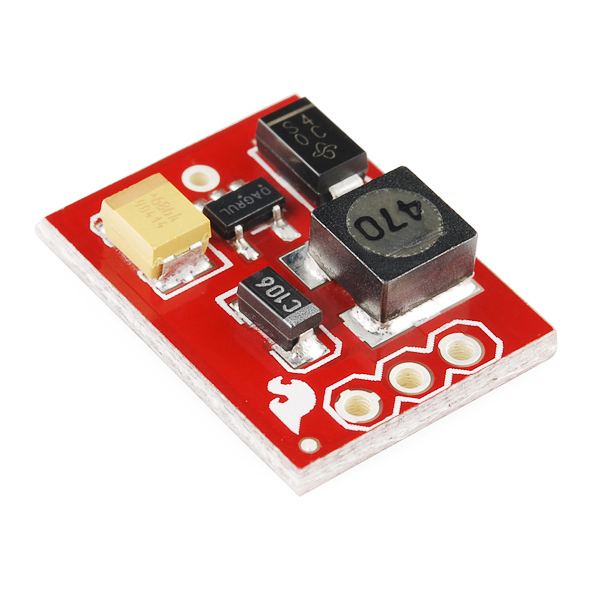 These little boards are awesome for AAA and AA battery projects for small circuits. Very easy to use, and it works as advertised. 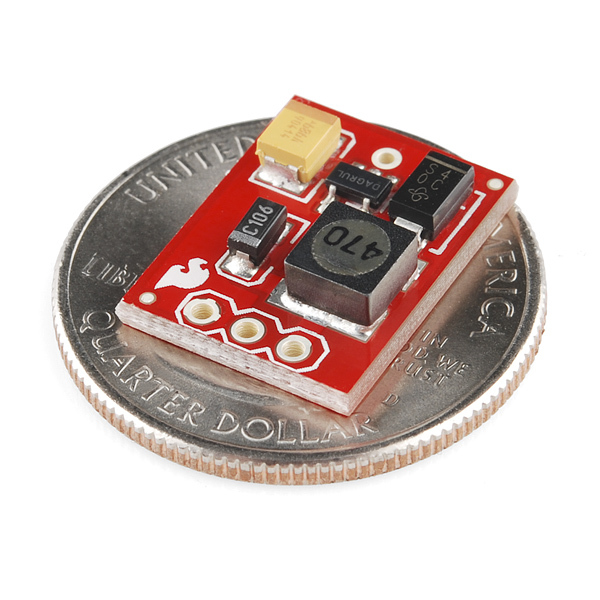 I picked up a couple of these to power some micro FPV systems I built using 600 line video cameras and 10mW 5.8GHz video transmitters and they work great. Even with brushed motors under load the video quality remains noise-free. Perhaps I'm using this incorrectly, but was used to ensure a constant voltage fro a 16 bit ADC. This thing ended up producing a lot of noise signal noise.